A crowd of screaming fans greeted Nadine Lustre when she arrived at TriNoma Mall Cinema for the red carpet premiere of Ulan, a coming-of-age romantic drama that sees the multimedia star on a solo trail. A number of JaDine fans waited for hours to stake out a spot near the red carpet on Monday evening to also have a closer look at the stars who would grace the event. Nadine walked the red carpet with director Irene Villamor and co-star Marco Gumabao. Her main leading man, Carlo Aquino, was not present at the premiere night. 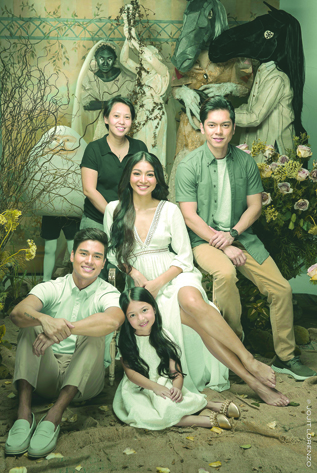 The lead cast of 'Ulan' Nadine Lustre, Carlo Aquino, Marco Gumabao, child actor Elia Ilano, with director Irene Villamor. James Reid, who was accompanied by his good friend and fellow Viva artist Sam Concepcion, was among the guests who supported Nadine’s first big screen project for 2019. In Ulan, Nadine takes on the demanding role of Maya, the young woman alternately fascinated and fearful of rainfall. Maya grew up believing that the rain, in its various forms, has a massive effect on her life. She remains fearful that rainstorms can result in tragedy and yet is eagerly expectant of the romantic emotions that can come with a sweet kiss under the raindrops. In one of the scenes, Maya’s teacher gave her a scientific explanation for rain—starting from evaporation until clouds are formed and become heavy causing precipitation. But Maya believes that rain is not always just water pouring down in steady drops from the sky. It was under such rain that Maya’s grandmother found true love. It was raining when she first kissed the man who became her husband and Maya’s grandfather. Sometimes rain can come with fearsome thunder and lightning and dangerous winds at sea. That is just like the rain that took the lives of Maya’s parents while on board a ship on their way home. The rain took her parents away. She never saw them again. Rain can also do strange things like suddenly invade a sunny day. A battle ensues. The red-hot sun shining with all its might to stop the raging waters coming out of the dark clouds. Maya’s grandmother told her that that is the rain that signifies heaven’s disapproval. Tikbalangs are getting married and that is why the sun is shining and it is raining at the same time. A nighttime creature from folklore, the tikbalang is a tall, thin humanoid with the head and long extremities of a horse and the body of a human. It is believed to inhabit the forests and mountains. Maya grew up alternately excited or fearful of the rain and stalked by storms and tikbalangs. The rain also became the reason for her failures and unhappiness. The kiss she did not get under the rain. The love she lost one rainy day. Still, she continued to wait. Hopefully, the rain which has been her close companion from childhood will bring her one true love. A Viva Films presentation, Ulan, which stars also stars AJ Muhlach, Joseph Elizalde, Ella Illano, Andrea del Rosario, Leo Martinez, William Martinez, Kylie Versoza, Angelo Bayani, Limer Veloso, and Perla Bautista, now screens in commercial cinemas nationwide.